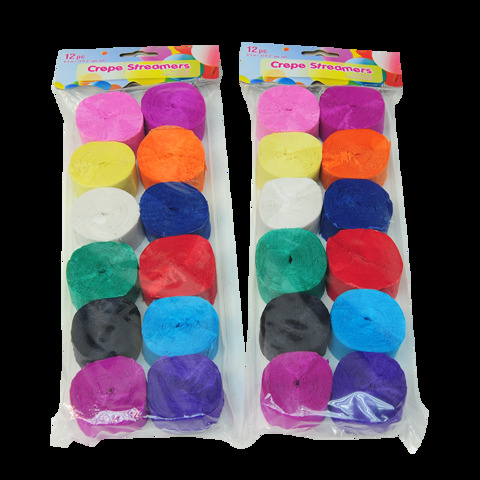 Crepe Streamers Solid Col. 12Pk. Each Roll: 4.5cm Rd x 2.5cm l Approx Roll Length Approx 10m. 12 Colours Per Pack: Black | Hot Pink | Red | Yellow | Light Blue | Purple | Mauve | Light Pink | Orange | Green | Dark Blue | White. Crepe Paper. 77G Packaging: Polybag with Header Card.